I rarely ate cauliflower when I was growing up, and the only way it was ever palatable to me was when it was smothered in cheese sauce. These days I eat and enjoy cauliflower on a regular basis. What changed? 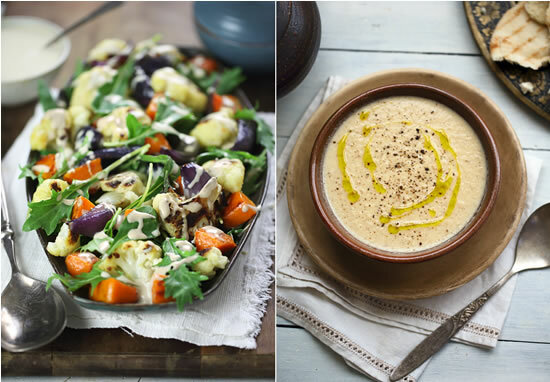 I simply discovered that when cauliflower is cooked in traditional Mediterranean and Asian ways it can taste amazing! 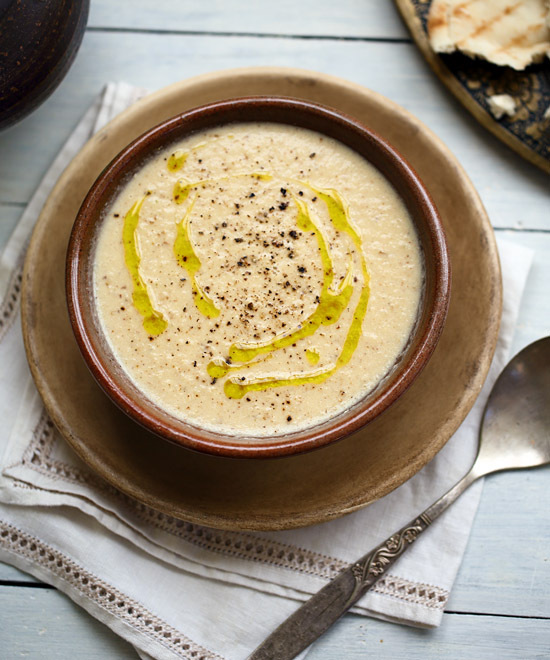 For example it can be turned into a warming and comforting soup such as Roasted cauliflower soup with tahini and lemon. Combine it with potatoes, onions and spices and you have the classic Indian curry Aloo gobi. 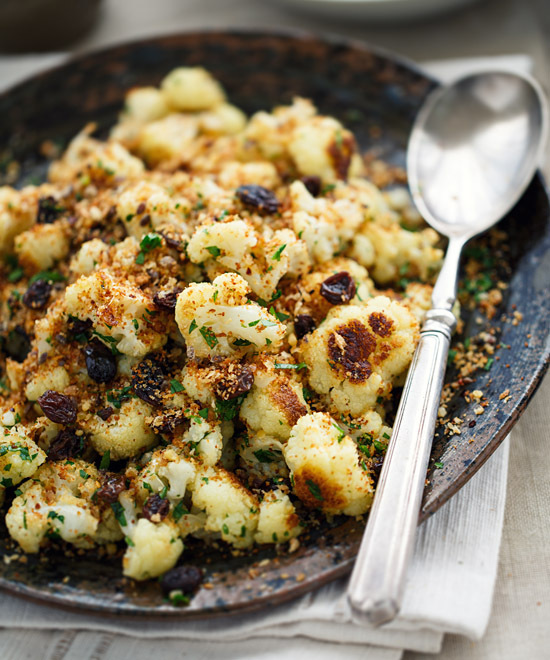 It can also be used to make delicious side dishes such as Sicilian roasted cauliflower with raisins and whole wheat chili-anchovy crumb. 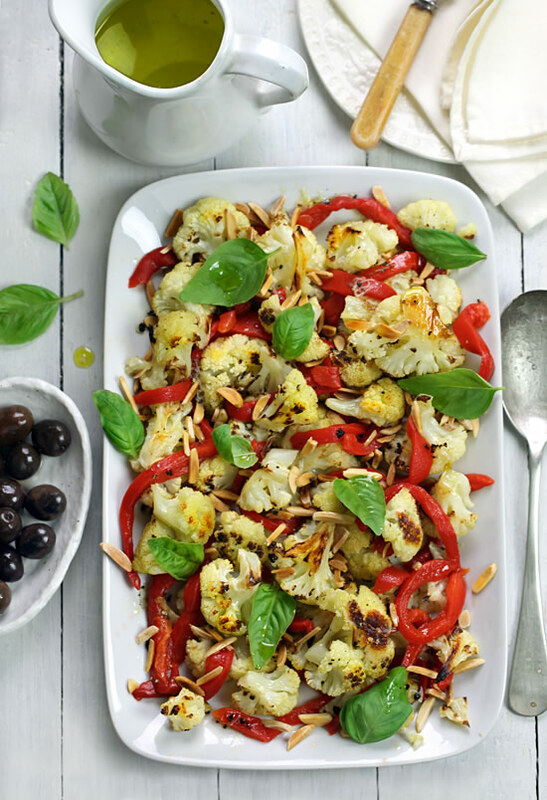 And it can be added to scrumptious salads such as Roasted vegetable salad with tahini-lemon dressing, and the salad I'm sharing with you today — Roasted cauliflower and red pepper salad with toasted almonds and basil. PREHEAT the oven to 450°F/230°C. 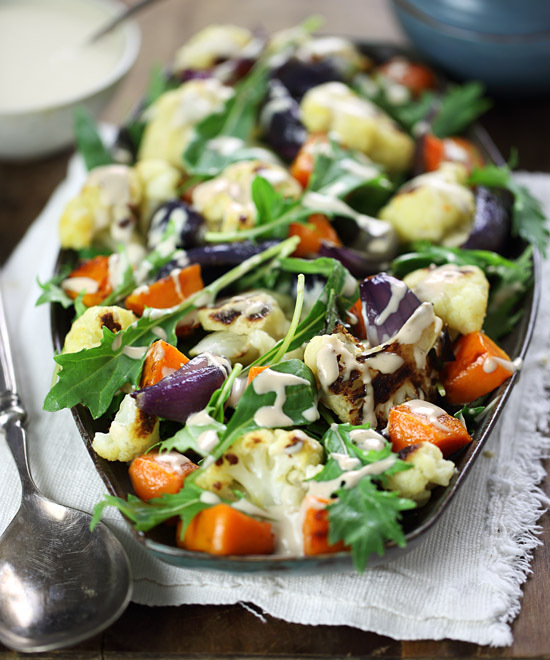 TOSS the cauliflower florets in 2 tablespoons of the olive oil. ARRANGE in a single layer on a large baking tray and cook for 15 minutes, then toss, and cook a further 10 minutes. WHILE the cauliflower cooks, combine the remaining 3 tablespoons of olive oil with the white wine vinegar, garlic, salt and pepper in a jar with a screw-top lid and shake to combine. TOSS the roasted cauliflower with the red pepper strips, toasted almonds and half the dressing. SERVE on a large platter with the basil leaves scattered on top, then drizzle with the remaining dressing.